Last spring, two University of Virginia engineering students posted a YouTube video demonstrating their model of a 3D-printed plastic turbofan plane engine. Their novel application of the technology caught the eye of bigwigs at the MITRE Corporation, a defense contractor based in McLean, Virginia. The company passed the video along the School of Engineering and Applied Science, which was looking for a couple of summer interns to work on a secretive 3D printing project. Responding the call, Steven Easter, one of the students in the video, stepped up to the challenge, bringing with him his brother and lab partner, Jonathan Turman. They ended up creating a 3D-printed plane that was test flown at Milton Airfield near Keswick in September. We have already seen examples of 3D printing breaking records on land, and now for the first time, we are seeing this new technology take to the skies. 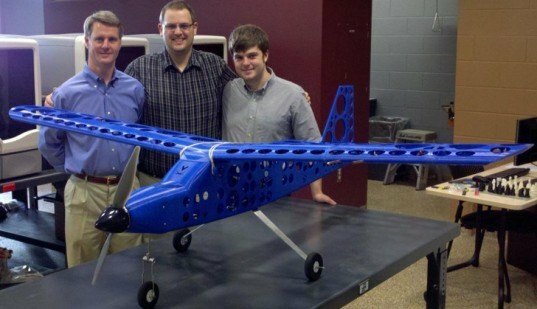 Steve Easter and Jonathan Turman, two engineering students from the University of Virgina, have helped design, fabricate, and fly the first plastic, 3D-printed airplane. Last summer, they were given the opportunity to work on a project to create an unmanned plane as a part of a Department of the Army Study. Mentored by their adviser, professor of engineering David Sheffler, the two set tackle their assignment. The plane was designed with a daunting 6.5-foot wingspan and composed of parts made almost entirely from the Engineering School’s Rapid Prototyping Lab’s seven printers. In August and Early September, the plane was tested during four flights, reaching cruising speeds of up to 45 mph. In the first test, the nose was damaged, and simply replaced by printing a new one, demonstrating a key advantage of fabrication-upon-demand technology. “Rapid prototyping means rapid in small quantities,” Sheffler remarked. “It’s fluid, in that it allows students to evolve their parts and make changes as they go — design a piece, print it, make needed modifications to the design, and print a new piece. They can do this until they have exactly what they want.” 3D printing also lowers the cost of prototyping by thousands of dollars, making the construction process cheaper as well as much faster. 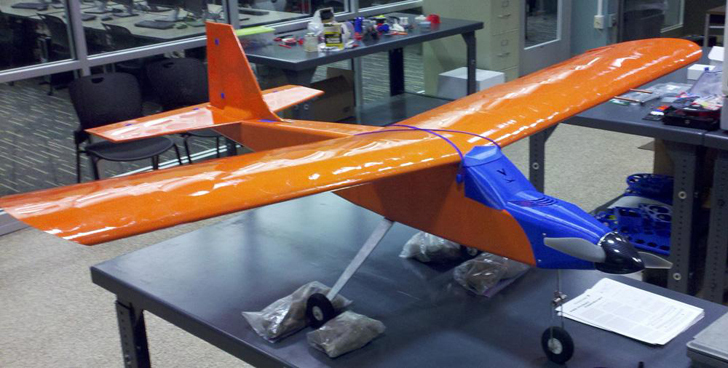 The plane is only the third known aircraft to have been fabricated and successfully flown using 3D printing technology. Members of the MITRE Corporation and Army officials witness the plane’s fourth test flight, and were so impressed with Easter and Turman’s efforts that they asked them to remain as interns into the academic year. Now, the students are seeking to make a model that is lighter, faster, and easier to assemble. Part of a fourth-year thesis, we are confident that the team will receive soaring marks. Is there a way of getting the files so that I can print it myself?